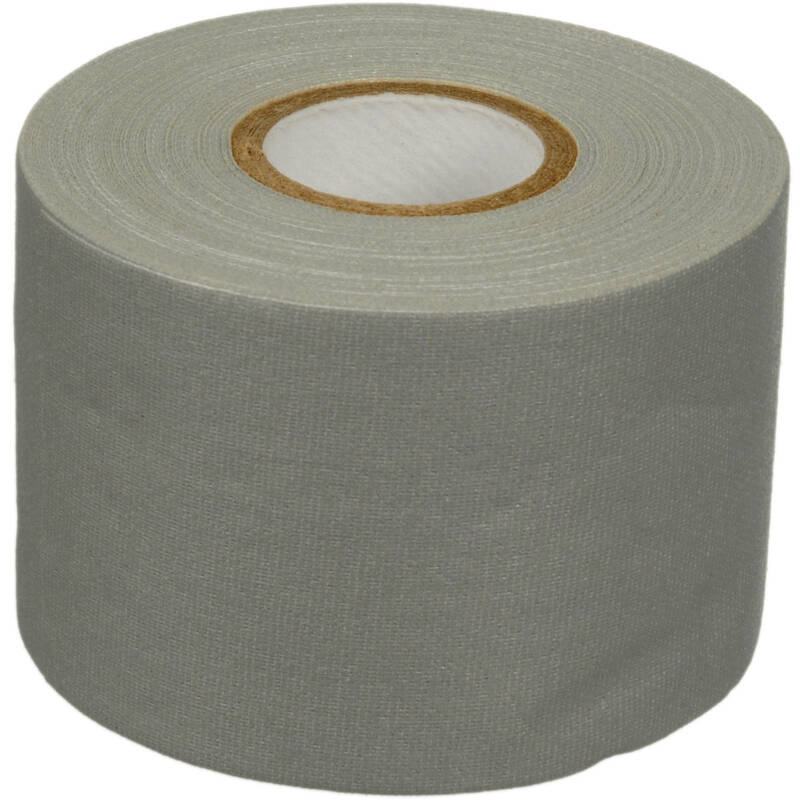 Take advantage of this roll of gray Pro Gaffer Tape from ProTapes, measuring 2" x 12 yards, to secure overhead lighting, audio wire, as well as set and stage decoration. It is also useful for artwork, framing, displays, graphics, and taping power cords down for a safer set. This Pro Gaffer Tape offers high tensile strength and a waterproof backing to withstand the elements as well as a long day of filming. It is highly conformable to a variety of expected and unexpected surfaces. It's easy to unwind and hand tearable, providing aggressive adhesive without leaving a sticky residue behind on your indoor or outdoor surfaces. Box Dimensions (LxWxH) 2.8 x 2.7 x 1.9"
Pro Gaffer Tape (2" x 12 yd, Gray) is rated 4.8 out of 5 by 538. Rated 4 out of 5 by DJ C*No from Can't nobody hold me down, oh no! I used this Gaff tape for big film productions and it did exactly what I thought it would do... hold down cables and wires. People walked over/onto it and it stayed put. This tape is like insurance, if you wanna make sure that you don't get sued cause someone trips over faulty wiring (cause for some reason you didn't make them fill out liability forms), buy this cause get what? On our production, no one tripped. We did not get sued. Oh! and it doesn't leave those nasty sticky markings either after your take it off. AND you can reuse it. That's what i do! Only down side is that it's pretty bulky but that's why you have Production Assistants right?! Rated 5 out of 5 by BjUpi from Not what I expected but I will buy it again I am used to 2 wide 50/60 yards long rolls with 2 core but this one came with 3/4 or 1 core. First I felt disappointed but immediately excitement took over. Due to smaller internal and external roll diameters, approximately 3-4 outside, I can carry these for emergency back up in all lighting and camera kits. Per inch price is higher than buying larger rolls but I will use it often for carrying convenience. Works for me but not for long lengths and larger projects. Rated 5 out of 5 by Kim K. from Best tape ever! This stuff is awesome, sticks to anything, yet doesn't leave any residue. Rips easily, even into tiny pieces, in either direction. In addition, you can use the same piece over and over again, I have an external harddrive I bring to work with my everyday, I don't want it hitting the floor accidentally, so attached two pieces of gaffer tape to the desk to secure it. End of the day I peel it away from the harddrive case no problem and be on my way, come in the next morning and reattache the same pieces which work just as well as the first time I used them. Great stuff! Throw away your duct tape! Rated 5 out of 5 by DeMarcus from Quality tape I was very pleased with the high quality and strength of this tape. It held it's own during and entire NFL game while shooting from the sidelines. It managed to hold onto and secure my secondary camera body lens hood from popping off (which happens more times than not with most professional NFL photographers). It securely held the lens hood onto the lens despite the banging around it took while moving from spot to spot and all the kneeling and jumping up while on the field. There was no residue left behind on either the lends hood or the lens itself after removal. So, until EVERY lens maker makes locking lens hoods and shoot action sports, there will always be a need for quality gaffer's tape. Rated 5 out of 5 by Anonymous from Simply good tape Simple, sticky gaffer tape - I use it to hold bits of backdrops/lighting modifiers/lens hood/etc. in place. I find it to be adhesive enough for my needs and easy to rip lengths off of. What else do you look for in tape? Rated 5 out of 5 by Jesse from Small compact roll of gaff to take on the road This is the perfect size roll of gaffer tape to stuff into a carry-on Pelican or other case when you're traveling light for a gig. High quality (as high-quality as any gaffer's tape I've ever used). Rated 5 out of 5 by RG from Great accessory to keep on hand Something that I always keep on hand. This tape is strong enough to handle most needs but does not leave residue or damage anything. Rated 4 out of 5 by Chris Santana from Great for a hip pouch If you want cost effectiveness, get the bigger roll of tape. This is a good backup for when you want to pack lighter. If you've never used Gaffer tape, you can rip it in straight lines by hand, and it is much higher quality than duct tape. Doesn't leave a sticky residue on your gear unless it's been in a hot car for a while. Then no tape is really safe. Is this the 6mil or 11mil tape? If you are referring to the tape's thickness, the thickness of the ProTapes Pro Gaffer Tape (2 x 12 yd, Black), B&amp;H # PRGT12B, is 9 mil / 0.229 mm. does gaffers tape leave a sticky residue on camera lenses? Hi there. This tape does not leave any sticky residue. can i use this tape on carpet? Yes.The best part of it is that you can use it...maybe a little longer piece than you expect for more holding power....but it doesn't leave sticky residue on the carpet that would only collect dirt and would be difficult to remove. its only 12 yards the picture looks like you can get a lot more then that ? Didn't get a whole lot out of this, better off getting a 55 yard 2 role. This is only convenient if you need compact roles for a camera bag, etc. Tape quality is very good.